In honor of my promise to myself to put my world in order, I've been cleaning closets and cabinets and cupboards. I have always needed internal order. It doesn't seem to matter how messy the world around me is, but messy drawers give me anxiety. Over the last two years, I let things get messy. The greater the emotional trauma, the more difficult it was for me to care about messy closets and cabinets and cupboards. Coping consumed all my energy. It was bad. I had Things That Don't Cut in the Things That Cut drawer. My measuring cup was in the Christmas Cupboard. My root vegetables waited in random dark corners of the kitchen. 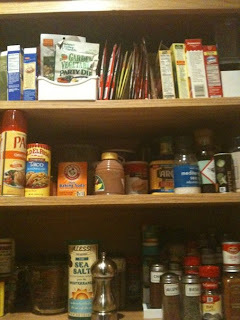 My once alphabetized spice rack -- well, it was so disordered I stopped using dried spices. This weekend I cured my kitchen of clutter. It is a thing of beauty, though pockets of disorder remain. I have confidence they will be a thing of history by the new year. While sorting and restoring, I stumbled upon my Thanksgiving stash. I have kept a journal of all things Thanksgiving since 1998. I have the recipes I used every year until 2007. I saved my timelines (1. Start the Turkey at 4:48 am. 2. Go back to bed for forty-five minutes...). I have the guest lists. I even rated each recipe. On a separate piece of paper, I found my Thanksgiving 2008 planner. 2008 was my first mom-less Thanksgiving. I wrote: "Shoulda paid better attention all these years. I have no idea how to make gravy. Buy bottled." Lucky for our guests, my mother-in-law makes a mean gravy. It's delish. This year's Thanksgiving is no exception to my "let's try something new" philosophy of holiday events. I have a new turkey idea that promises the most succulent turkey to date. I no longer need a recipe or timeline for anything else on the menu. I heard a recipe from a friend for a divine cranberry dessert I think I'll try, more because I love watching the cranberries pop than because I think anyone will eat it. While I'm cutting and basting and mixing, I'm going to be thankful. I'm going to be thankful the last two years are in the past. I'm going to be thankful for the people coming to share the feast. I'm going to be thankful that my spices are alphabetized once again. And I'm going to be thankful for all these blessings without worrying about what will happen tomorrow. That, I think, is the art of being thankful.